Please include details about the machine and a written description of each coin. In the last 1300 years Spike Island has been host to a 6th century Monastery, a 24 acre Fortress, the largest convict depot in the world in Victorian times and centuries of island homes. The island's rich history has included monks and monasteries, rioters and redcoats, captains and convicts and sinners and saints. Today the island is dominated by the 200 year old Fort Mitchel, the star shaped Fortress which became a prison holding over 2300 prisoners. Take the scenic ferry ride from Kennedy Pier, Cobh, and enjoy a fully guided tour of our island and fortress, and relax in our cafe and picnic areas. Get captured in the history and mystery of this magical heritage island. This machine from ThePennyPress is situated in the gift shop of this popular tourist attraction. 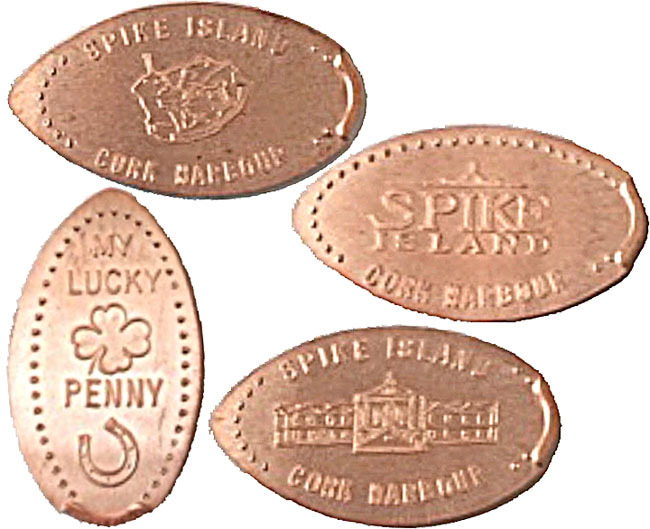 4) 'My Lucky Penny, clover.